LiveU video broadcast services at Mainz Marathon. Hackensack, NJ, June 2015: LiveU, the pioneer and leader in IP-based live video services and broadcast solutions for acquisition, management and distribution, has announced that its LU-Smart smartphone bonding app has once again been used for innovative coverage of the recent Mainz Gutenberg marathon, following its successful debut at the 2013 event. In combination with broadcast cameras, production company Tividoo provided significantly increased online and broadcast-quality coverage. 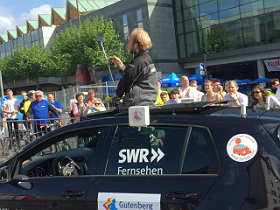 The popular event, held in the scenic German town along the banks of the Rhine, was again covered by regional public broadcaster SWR live online and with a roundup show on SWR TV Sport. Production company Tividoo worked in conjunction with OB provider Simon Media to capture and deliver the enhanced coverage. The iPhone 5 with LU-Smart allowed footage to be captured in a moving vehicle especially tailored for the event by Tividoo, using a unit to hold the phone steady. This allowed the race to be followed as it moved through the city providing a real sense of the occasion. A second LU-Smart was used for redundancy. The iPhone used 3G/4G connectivity bonded with Wi-Fi in the car – provided by a multichannel VPN router – as well as additional SIMs in the router. The LiveU server received the feed in the stationary OB unit where it was vision mixed with signals from four other cameras, including broadcast units. In order to overcome fixed line difficulties, the final signal was also uplinked using a combination of cellular and Ka-Sat connectivity. LiveU owns the patent for cellular bonding for remote news gathering in the US and other countries. All LiveU products are based on this fourth-generation patented technology.